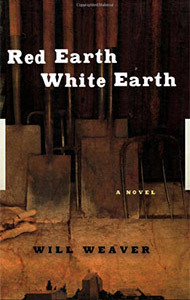 Weaver’s best-selling 1986 debut novel was adapted for television film and broadcast by CBS. The plot explores the lingering conflict between Native Americans and whites in the contemporary Midwest. At the center of tension is land and birthright. The novel opens with prodigal son Guy Pehrsson returning to the land, summoned by his grandfather’s terse letter: “Trouble here. Come home when you can.” Guy finds the unambiguous world of his childhood shattered. Local Ojibwe Indians have laid claim to the Pehrsson farm, as well as other lands nearby, and tensions run high. To complicate matters, Guy’s mother has fled an empty marriage, finding sanctuary with a young Indian lover. How Guy Pehrsson makes peace with his past, confronts his present, and faces his future is the story of this novel, which reviewers likened to the hard-hitting realism of John Steinbeck. After some years of working in the short story form, I knew RE,WE was a story that could not be contained in twenty-some pages. It’s an intensely personal family story, fictionalized, about culture clash and land. When the novel was half-written, my agent quickly sold it (in a publisher’s bidding war) for a six-figure sum. My literary life was turned upside down-and I still had to finish the book. It has some obvious first-novel flaws (one critic said that I tried to squeeze three novels into one), but there’s some good writing in spots, and one has to start somewhere with the novel form.